"We want comfort or we want to look good, so we avoid the truth because the truth is painful." Booklet 3 of 6 in the Knowing God series. In this extraordinary teaching, Martha shares her own story of repentance and explores the rarely taught secrets of this vital work of the Spirit. A foundation of repentance is essential! The very foundation on which we grow is repentance. You cannot have faith without going through the process of repentance. It is basic. Repentance is the beginning of every move of God—private or corporate. “The remedy to the hideous list in Romans 1 is repentance. And it is a complete solution because true repentance changes YOU. There is no other way of solving the human problem acceptable to God. “Paul has identified the problem and given the solution, and given the problem that stands against the solution. Do you understand? He said when you resist repentance, you are storing up God’s wrath. When your stubborn and unrepentant heart stands in the way of repentance, then you don’t have repentance—and so you miss the one solution. “Revival comes through repentance and only through repentance. If you have repentance in your life continuously, then you will have revival that is continuous. The wind of the Spirit blows repentance first before He blows blessing, or healing, or revelation. In Foundation of Repentance, Martha shares her own story of repentance and explores the rarely taught secrets – and overwhelming rewards – of this vital work of the Spirit. 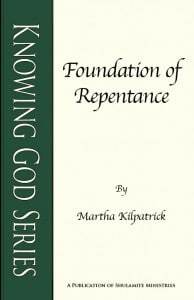 Foundation of Repentance is now available in both print and digital format. Father, we do not deserve the presence of the Holy Spirit, for we are a rebellious people. But we ask You to give us the Spirit out of Your goodness, and out of Your mercy, and out of Your love for us. Lord, we can do nothing; we can understand nothing except the Spirit reveal it to us and open our eyes. Lord, let the Spirit reveal what is in Your mind, and then let Him show us all that You have given us. In Jesus’ Name. In The Great Lie, we began by studying God’s divine nature, and in Eternal Power we focused on His eternal power. We found that we have believed this lie: we need power within ourselves. When the Holy Spirit comes in power, it is possible to miss Him if you are not prepared to receive Him. And the only way to get prepared is through repentance. We need to understand the place of repentance in the work of the Spirit. That is what I want to talk to you about because it is vital to everything that follows – both in your personal life and in the church. I want to tell you God’s story in me. As a teenager I knew God’s presence and call, but as a young adult, I wasn’t very interested in God—I had my dream life and I was on top. I didn’t know this was ‘repentance,’ brought by the Spirit. I just knew it was the truth. The unbearable truth. My despair went deeper and deeper. God was visiting me, confronting me, but it seemed He was nowhere around and He was not hearing my cry. Thou shalt love the Lord thy God with all thy heart, with all thy soul, and with all thy mind. And that was the worst of the despair. If love for God was what He required, then it was hopeless. I was hopeless. I had no such total love for Him as that haunting verse demanded. I was attending church but somehow I knew the people I saw didn’t know God. I was looking for Him fervently, looking in lives to see if God was there. Somehow I knew there would be a glow on the face of anyone who knew Him. There would be some obvious evidence if a person knew Jesus. But I saw no one, heard no one who gave any evidence of God’s presence. And then, in what I understood later was a rather unusual encounter with God, the Lord came into my life in a powerful way, into my aloneness. I began to read the Scriptures and Christ revealed Himself to me – just as real as you are. I spent two years in glory. I could weep by the hour with love for Him. He had given me the love He required of me. I thought that was every believer’s experience. I came to understand later that it isn’t. After many years I began to understand that what I had experienced was a process of repentance. Repentance is like a ball game. God tosses you the ball and says, “You are this!” And if you say, “Yes, I am,” you toss the ball back to Him. But He tosses it back to you again and brings you a worse accusation: “Yes, and you are this!” If you say, “Yes, I am,” you toss the ball back to Him and continue the process. And then! You meet Him in your forgiveness. I understood that Christ’s appearance in my life in a profound way was not only because of my election. It was not because of my anointing or my calling. It wasn’t because of my worthiness. It was because of the level of my repentance. The depth of my repentance was the depth of revelation of Jesus Christ. And I understood that the experience I had shouldn’t be unique to me—but rather, that if we allow God to search us, we could all know the depths of such revelation, such intimacy with the Lord Jesus Christ! I didn’t know it was God who was negotiating with me! I didn’t know then that the verse appeared at His hand, by His Spirit; I didn’t know anything! I just stumbled into telling the truth…without any pretense, and without any excuses. So I want to say to you that repentance is the work of the Spirit. You can search your own soul only so far; the nuances and depth of your sin, you will never see. If, when the Lord came to me and told me, “You are not a good wife,” I had said: “Well, the husband Thou gavest me, he made me sin!” I wouldn’t be here, speaking of Christ, years later. In the work of repentance, you can drop the ball if you don’t assume complete responsibility for your sin without any excuse, and without any blame on anybody, or anything, or any circumstance. Whenever you excuse your sin by blaming another, you are actually blaming God for your sin, and you dismiss the Spirit who alone can bring the presence of God. Repentance. Oh, God, give me words to express it! Repentance has to come first! And to the measure that you receive repentance—to that measure you will see Him! Ephesians 5:4-5 gives a whole list of things not to do—immorality, greed, filthiness, foolishness, sinful talk, coarse jesting—and then it says: “For this you know with certainty, that no immoral or impure person or covetous man, who is an idolater, has any inheritance in the kingdom of Christ and of God” (NASB). The Amplified says, “Let no one delude and deceive you with empty excuses and groundless arguments (for these sins) for through these things the wrath of God comes upon the sons of rebellion” (v. 6). Do you remember the servant who buried his talent? He said: “I knew thee, that thou art a hard man, reaping where thou hast not sown and gathering where thou hast not strawed. And so I buried my talent. I was afraid” (Matt. 25:24-25 KJV). He believed God was not good. And that was his convenient excuse! God is not a hard master reaping where He has not sown. But because this man refused God, he could bury his talent and then blame God as the explanation for his disobedience and failure. He fabricated flaws in God so he could indulge his laziness. And this is typical human reaction to responsibility. But God didn’t buy the excuse and He will not buy ours. Rather, in the parable the Master said to him, “Thou wicked and lazy servant” (v. 26). The one who buried his talent said, “You are so hard, I was afraid of you.” But God said, “No, it wasn’t fear. It was wickedness and laziness. Take away his talent and give it to the one who multiplied, and cast him into outer darkness where there is weeping and gnashing of teeth” (paraphrased). When I began to walk with the Lord and listened to teachings in various churches, I was taught that believers will not give any account. I was taught that unbelievers will go to the judgment seat while believers will go to the mercy seat—and that there will be no mention of our sins. Every man will give an account for what he has done. There are many scriptures addressed to believers that say there will be an accounting and there will be consequences—terrible consequences. I cannot escape those verses when I read the Word. There will be consequences for omissions and commissions. The New Testament reveals the full forgiveness of God—but even Paul also focuses on the evaluation of God. You will be very healthy if you have your eye on that evaluation. It is a terrible prospect that frightens the most hardy of us. But it is real. You will face God with utter exposure. Expose it now while it can be remedied, because you will face Him! Each of us will give an account of himself to God. I am so glad that is clear to me. It makes me live differently! A false grace is a present comfort but a future disaster. Grace is total—but it must be received. I have taken care of two people right down to death’s door and I can tell you that God gives a chance at death’s door for one last sweep of repentance. It can be a terrible time to repent, but better then than never. Grace goes to the last breath but when that last breath is drawn…everything is set for eternity. For the word of God is alive and powerful. It is sharper than the sharpest two-edged sword, cutting between soul and spirit, between joint and marrow. It exposes our innermost thoughts and desires. Nothing in all creation is hidden from God. Everything is naked and exposed before His eyes, and He is the one to whom we are accountable. The Word of God is alive and active, but it comes to split you open: to divide what is soulish and what is Spirit, to reach into the very motive of your heart—why you do what you do. God is not impressed with what you do; He is interested in why you do what you do and where it came from. Did it come from the power of God or from self? Sometimes you don’t know your why, but the Word of God comes to divide and lay bare your thoughts and intents. And it is excruciating! It is hideously embarrassing. I have long ceased to be embarrassed in front of people. I am embarrassed in front of God. You don’t know the half of it, but He does. Get into the Scriptures and ask God for the right teaching at the right time. Seek somebody who knows you who will seek the Word with you. We have an awful accountability in our group—a wonderful accountability. Let the righteous smite me; it shall be a kindness. 2. Tell the truth. Don’t be afraid of the truth. Truth is liberating! If your heart is cold and you don’t repent, confess that! I don’t always know the work of repentance, the continuous work of repentance, going on in my life. 3. The third one is: pray, pray, pray for repentance. Do as the Puritans did and ask for the ‘gift of tears.’ In our group, we pray for a work of repentance. 4. Fourth, confess what you do know. Prime the pump! 5. Finally, let your heart be broken. Don’t resist the pain—be like that dear woman whose heart was broken over her children. It is pain that comes to a happy ending, a good conclusion—liberty and union with God. Repentance is a gift—a precious, precious gift. And God is faithful to us. If you refuse to repent, God will send LIFE to you (and a whale sometimes). He is faithful and He will perfect us. If we have ever said, “God, take us on to the fullness of maturity in Christ,” He is going to bring us to repentance. I pray for one thing for us…courage. I need an impartation of courage to accept my sin, to confess it and own it with no excuse or blame, and to put it under the Blood. I want to tell you that when Jesus bought your sin, He actually bought it. Your sin belongs to Him. It is His, not yours! If you will ever just give it and let it be, you can be rid of it. He bought it at a high price. But if you keep it, you put yourself under the penalty of it and you lose the benefit of the Cross. When God took you over, and undertook for you, He took your failings, your sins. They are His! Separate yourself from them. They are not you.